myblackfriendsays.com: the dying of the light. 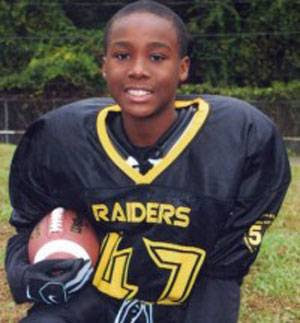 This 11-year old boy committed suicide last week. Carl Joseph Walker-Hoover hung himself with an extension cord in his room while his mother was cooking dinner. Carl was subjected to daily bullying at his school because some of his classmates thought he was gay. This is at least the fourth suicide this year of a middle school child because of bullying. Can you imagine finding your 11-year old son dead after a suicide? Can you imagine being 11 and in so much despair that you think that killing yourself is the answer to your problems? Can you imagine being a middle school bully and finding out the person you've harassed mercilessly is dead? This is such a senseless, senseless tragedy. These kinds of story fill me with great sorrow!! I just don't know what is wrong with people. What's so crazy is that a lot of the parent's know their kids are doin it and do nothing...it outrages me. They tell their kids they are right for anything they do anymore. My grandmother who raised us would have tanned our butts for us, but good. Great post and thanks......I hope they pass that bullying law where the kids and the parent's (if they know) all get punished - severely. Oh, man. This is terrible. That's so sad. We recently had a very similar case here in Italy but what happened after the suicide was just disgusting at least in my opinion: even though everybody knew the guy was bullied because he (presumably) looked as if he was gay, media started attacking everybody who brought to light the invisible homophobia behind the bullying, saying that referring to homosexuality would have insulted (!) the mother and that the gay and lesbian movement was trying to take advantage of this tragedy. On top of it, the school principal sent a letter to all the class and schoolmates assuring them it was not their fault. As you said, this is so wrong on so many levels. People don't take bullying seriously enough. I moved right before 6th grade to a new school district where I didn't know anyone. I got targeted because I was new and used to run home from school in fear everyday. It was horrible and, even though it "only" lasted for that one year, really shaped my personality for the rest of my school years. It breaks my heart when I hear stories like this. Just so senseless and avoidable. Bullying should be taken as seriously as alleged abuse or child misconduct, IMO. Growing up, I saw so many instances of bullying (one ultimately resulting in a suicide)...it's beyond ridiculous that nothing is being done about it in our schools.